The award-winning Leighton Hall is the home of the famous furniture-making Gillow family. This historic house, with its Gothic towers, enjoys a spectacular setting near Carnforth in Lancashire. The family opens the house and grounds to the public every summer. The hall boasts many stunning and unique examples of Gillow furniture. Unlike many historic houses, Leighton Hall has no roped-off areas. Visitors are free to wander and even sit on the furniture while being shown around by one of the enthusiastic guides. Tours last just over an hour. Every day at 3.30 pm there are flying displays by the resident birds of prey. While the birds soar overhead the falconer provides a commentary covering their training, feeding, and hunting habits. Visitors are welcome to explore the 1,600 acres of gardens and grounds at their own pace. Features include woodland walks, a Victorian walled garden, and an ornamental vegetable plot. For children there’s a play area, dens, and a maze. The tea room sells sandwiches, cakes, tea and coffee, and soft drinks. Other facilities at Leighton Hall include a gift shop and public toilets. Admission prices are reasonable and haven’t gone up much in recent years. The price of a standard ticket includes the tour of the house, access to the gardens and parkland, and the birds of prey display. Tickets allowing entry to the gardens only are also available. Throughout the year, Leighton Hall is the setting for many fantastic events. Visit the official Leighton Hall website (see information box below) for further details. The house and gardens are also a popular wedding venue. The owners can provide help with all aspects of the wedding including photography, catering, flowers, and transportation. Leighton Hall is open Tuesday to Friday from 2 pm to 5 pm (and Bank Holiday Sundays and Mondays) between May and September. It is also open on Sundays in August. 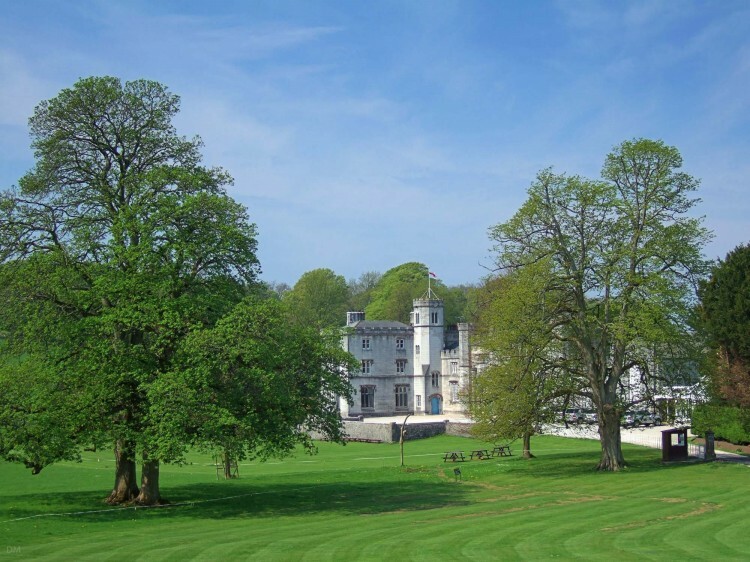 Leighton Hall is located near Carnforth in Lancashire, about seven miles north of Lancaster. To reach it by car leave the M6 motorway at Junction 35 and then take the A601(M), signposted to Morecambe and Carnforth. At the first roundabout turn right onto the A6 and follow the brown tourist signs to Leighton Hall. The postcode for Leighton Hall is LA5 9ST. However, the owners advise against using satellite navigation systems to find it. Parking is free for visitors. Carnforth Train Station, an attraction in itself, is approximately three miles from Leighton Hall. Silverdale Train Station is just over one mile away. It’s possible to walk to Leighton Hall from here through the Leighton Moss nature reserve. Map showing location of Leighton Hall. Leighton Hall is a really nice country estate. They hold a number of outside events like the Red Rose Land Rover Club meetings. Leighton Hall is lovely and the gardens and surrounding countryside very beautiful. Train station in Carnforth, Lancashire. Known for its connection with the movie Brief Encounter. Train station in Silverdale, Lancashire. Close to the Leighton Moss nature reserve.